Not very many authors can successfully write two completely separate mystery/suspense series at the same time without plot lines and characters crossing over, however unintentionally. Griffiths does a pretty fine job of it with this third entry in her Max Mephisto series (her other being the Ruth Galloway series). We first met Max in The Zig Zag Girl, where Griffiths laid out the past experiences of The Magic Men, a super-secret group of spies assembled during World War II specifically to mislead the enemy through illusion. Max and Edgar Stephens, now a Detective Inspector, joined forces then to solve a grisly murder tied to one of Max’s magic tricks, the Zig Zag Girl. 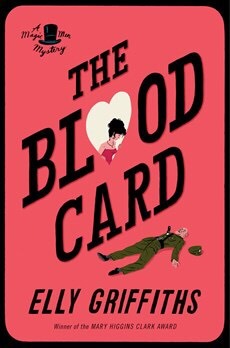 In Blood Card, Max and Edgar reunite at the request of a mysterious military man who asks them to look into the murder of one of their former commanders, who was found in bed with a knife sticking out of his chest, and an ace of hearts, the “blood card,” next to him. As usually happens with magicians, all is not what it seems, and Max & Edgar soon connect the death of their former commander to other mysterious happenings, including the supposed suicide of a local gypsy woman. They proceed to gather clues through a trip to the United States, brushes with death and anarchists, and an opportunity to appear on television until they come to understand the end game is far more dangerous than any of them bargained for. As is typical for Griffiths’ stories, there are dozens of loose ends, red herrings, and clever clues flying through this story. Also typical for Griffiths, all those tasty little bits of information are gathered together and resolved handily by the end. I was not an immediate fan of the Mephisto series when I first read Zig Zag Girl, but Max and Edgar (and Ruby, Max’s daughter & Edgar’s fiancee) are growing on me. I liked them all a bit better in Smoke & Mirrors; Blood Card has left me fond of all of them and looking forward to the next in the series. Recommended for fans of British mysteries.